When news broke that writer-director Paul Thomas Anderson was going to make a period romantic drama starring Sir Daniel Day-Lewis in what may end up as his last on-screen appearance, the announcement both delighted and subdued the entertainment world. It is fortunate, then, that P.T. Anderson rebounds from the marijuana-fueled, comedic neo-noir haze of ‘70s Los Angeles in 2014’s Inherent Vice, to the nuanced and tender fashion world of ‘50s London in Phantom Thread. 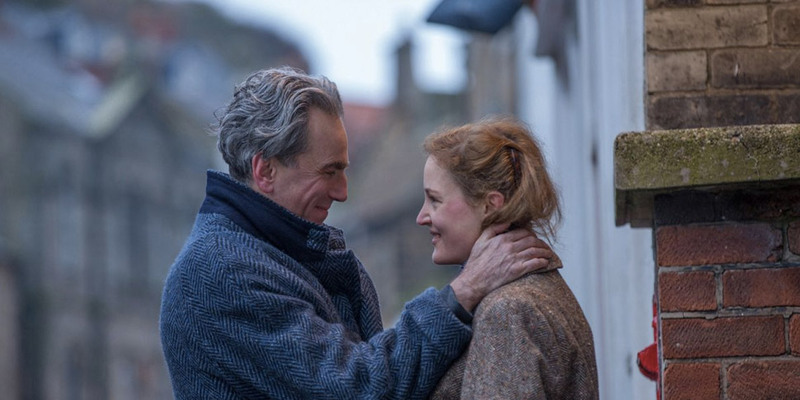 Phantom Thread boasts not just P.T. Anderson’s meticulous cinematic craft and Day-Lewis’ commendable acting, but also a sturdy supporting performance by Lesley Manville and an eye-opening and breakthrough lead turn by Vicky Krieps. Anyone assuming a typical and perhaps trying doomed romance plot will not prepare well for the movie’s breathtaking third act. Renowned dressmaker Reynolds Woodcock (Sir Daniel Day-Lewis, in reportedly his final role) and his sister Cyril (Lesley Manville) are at the center of 1950s post-war British fashion. European royalty, stars of stage and screen, and other women from affluent backgrounds revere the House of Woodcock brand. The women who cannot afford such luxuries desire instead to model Woodcock’s prototype outfits. Some have even provided inspiration and intimate companionship for “confirmed bachelor” Reynolds, at least for a time. Lowly waitress Alma Elson (Vicky Krieps) finds herself in line for this task when Reynolds spots her during his and Cyril’s weekend trip to their coastal childhood cottage. Reynolds fixates on Alma’s youth and strong will and she becomes his muse and lover. Reynolds must soon decide whether to accept this turbulent romance in the precise and established routine that has lorded over his adult life. Though a doomed romantic drama set in the fashion scene of ‘50s London may not appear adventurous on the surface, writer-director P.T. Anderson manages to recreate this world with tender loving care. The Woodcock dresses and general character costumes designed by Mark Bridges (Oscar winner for 2011’s The Artist) breathe life into this bygone setting, as does the fluttering and jazzy score from Radiohead guitarist Jonny Greenwood (Anderson’s go-to composer since 2007’s There Will Be Blood). The sterile precision of everyday haute couture errands in the House of Woodcock gives the familiar plot an intricate and intimate obstacle that it must overcome and with which it must also cooperate. Anderson further takes time to establish particular arenas in which the romance must do battle. The Woodcock’s breakfast table is one such battleground, where the noisiness (courtesy of Christopher Scarabosio and Matthew Wood’s pronounced sound effects) of how Reynolds’ current female companion dines, Alma included, can spoil the rest of his day. Food, come to think of it, lays the first seed of Reynolds and Alma’s romance and later becomes the factor that decides this couple’s fate, resulting in the romantic drama’s gripping final act. As for performances, only a fool would doubt that the esteemed Sir Daniel Day-Lewis will contend for a fourth Best Actor Oscar for his turn as the brilliant yet frigid fashion designer. Phantom Thread allows Day-Lewis to end his storied career with a bang—not necessarily a Michael Bay-scale explosion, but rather a relieving, impassioned, and soulful implosion, indicative of Day-Lewis’ masterful talent in conveying human behavior with peerless accuracy. Veteran British actress Lesley Manville displays a cheeky resilience as old maid sister Cyril, even though I would have loved more scenes of dialogue involving her. Last but not least, Luxembourger actress Vicky Krieps deserves more than the mere two Best Actress nods from the film critics of Boston and Chicago—paltry when compared to the widespread praise for Day-Lewis and Manville. With playful formidability, Ms. Krieps matches Day-Lewis step for step in their scenes together, from their first scene where she serves him breakfast to their climactic scene where she cooks him a buttered mushroom omelette. I hope English-speaking audiences (who may fail to recall her small appearances in 2011’s Hanna and 2014’s A Most Wanted Man) will get to see more work from Ms. Krieps in the years to come. Certain names have the power to make a film essential to watch, at least for any cinephiles worth their salt. As the latest effort from master writer-director Paul Thomas Anderson and as the swan song outing from legendary actor Sir Daniel Day-Lewis, Phantom Thread is one of the few essential cinematic experiences of 2017. It is an experience, though patient and challenging, that thrives in the delicacy and subtlety concocted by a visionary artist—one that would cause the spirits of Alfred Hitchcock and Stanley Kubrick to smile.